The non-hydrogenated 'heart healthy' margarine, an established choice for those 'at risk' of heart disease. Meeting the health needs of today's customer. Huiles de canola et de tournesol 74%, eau, huiles de palme et de palmiste modifiées 6%, sel, babeurre en poudre 1% (lait), arômes naturels, acide lactique, palmitate de vitamine a (vitamine a), vitamine d3, colorant naturel, lecithine de soja, edta de calcium disodique. 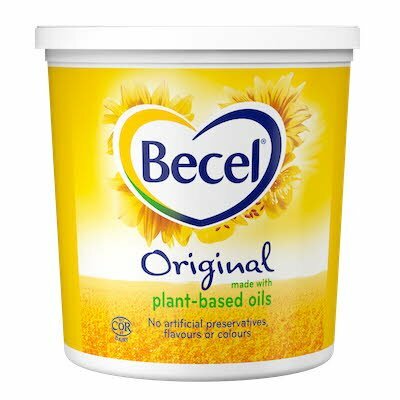 Becel is the #1 consumer brand of margarine. It is non-hydrogenated, low in saturated fat, and cholesterol free. Becel is also a source of essential fatty acids such as omega-3.